Who hasn’t grown up loving Peter Pan? I still enjoy the Disney movie, and just last year I took my kids to a high school production. Peter has prompted several excellent spinoff stories, such as the 1991 live action movie, Hook, and the Starcatchers children’s literature series. I haven’t seen the 2003 movie version, but I want to. Peter is still alive and well in the world’s hearts and minds, and still a little boy. After all, he never had any intention of growing up. Since I recently reread the Starcatchers books, I thought I’d go back and read the original novel. It is an amazing story, one full of originality, humor, and adventure. It would have to be pretty great to still be so loved one hundred years later. I do have to admit, however, that I like the modern adaptations I’ve grown up with better. I’m a little ashamed of myself for it, but there it is. The story is the one we know; our later versions have not been modified much from the original. But the novel has an antiquated feel to it. It tends to wander at times, with lots of interjections from the author that I found a bit distracting. And of course it uses quite a few words we—kid especially—don’t use anymore, like “bacchanalian,” “quixotic,” and “miscreants” (therefore, I’d give it a fifth grade reading level). Peter’s a brat, too, as irritating as often as he is endearing. But it’s the same whimsical story with a dog for a nurse, a thimble for a kiss, and flying children. I still love it. Those quotes serve as excellent examples of the novel’s quaint style, which I love, but the book is old-fashioned in some other ways, as well. I’m usually the last person to complain over racial stereotypes, but the treatment of the “redskins” in this one even made me cringe a time or two. At one point the entire Piccaninny tribe “groveled” at Peter’s feet calling him “Great White Father.” The book also takes a rather callous approach to the many pirates who are skewered by our hero, unlike the gentler later adaptations. This callousness stretches to the children as well. They’re quick to leave their parents, quick to forget their parents, quick to leave and forget Peter, the loyal lost boys abandon Peter, Peter is absolutely despising of mothers, and Peter, by the end of the book has even forgotten Tink. The adults are not exempt, either, when they argue whether or not to keep their newborn children. The novel has a totally different emotional basis than the modern adaptations. It’s almost tragic in its callousness. On the whole, however, this is a much loved and endearing story for good reason, and I’m glad I read it. Otherwise I’d never know that Captain Hood played the harpsichord. And did you realize the Jolly Roger doesn’t actually fly? I believe we can trace that rumor to Walt. 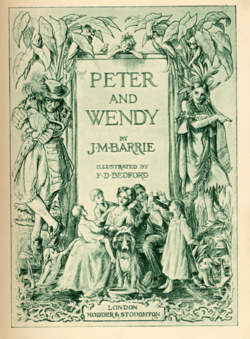 Anyway, I recommend Peter and Wendy as a classic worth reading aloud together. And it’s free for Kindle. Have never read the original book. It sounds a little dark. I have also loved the stage version of Peter Pan with Mary Martin — it was magical to me as a child. I also loved Hook. And, I saw Cathy Rigby perform the Broadway version of Peter Pan a couple of times. Thank you for reviewing the book, I had no real sense of the original story. I think modern readers have taken the best of the book and molded into today’s popular version and left out the dark. There’s a difference.